Learn how to do essential tasks in Connections Mail. 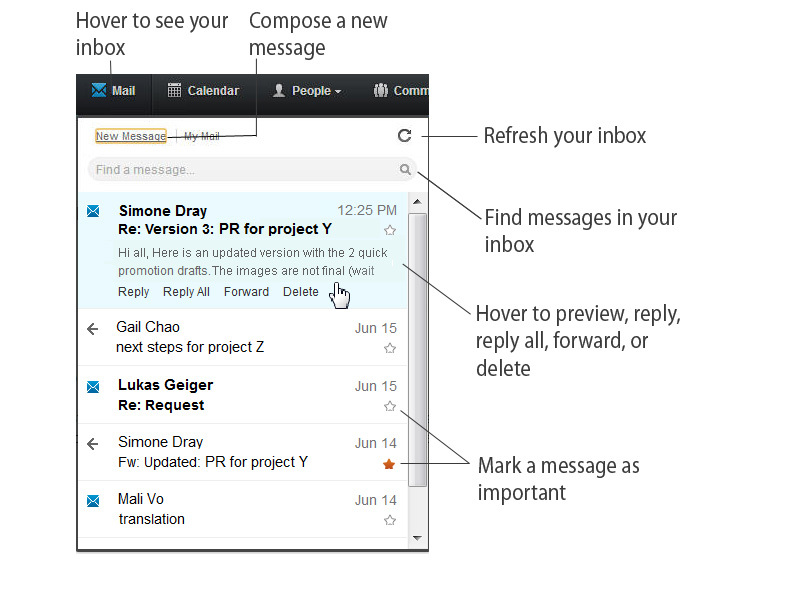 Check the new message indicator over the mail icon. Click a message in your inbox. Click the message to open it. Click Move to folder, and then select a folder. Click a meeting invitation in your Connections Mail inbox to open it. In the Mail window, click the corresponding button to accept, decline, or update the meeting. When you receive an email with an attachment, you can save the attachment to your computer or to Connections Files. Saving it to Files makes it easy to share and collaborate on the file. Click Download or Share next to the attachment. Click Load more messages at the end of the inbox. When you start typing a name or email address in the To, Cc, or Bcc field of an email, a list of relevant contacts displays. In Connections Mail, you see contacts from Notes or Outlook, and from your Connections network. To make sure that all email address are correct, click the Check names link. While composing a message, click Attachment, and select options. Emails are saved according to the mail preference you set in SmartCloud Notes Web. Enter search terms in the search bar in the inbox. Search in all fields, the From field, or the Subject field by clicking the arrow next to the search bar. Note: If you use Domino® mail servers, the search feature displays only if your mail file is full-text indexed. With a message open, click the previous arrow to see to the previous message, or the next arrow to see to the next message.